We cannot ship internationally at this time using the form below, but contact us about other options. 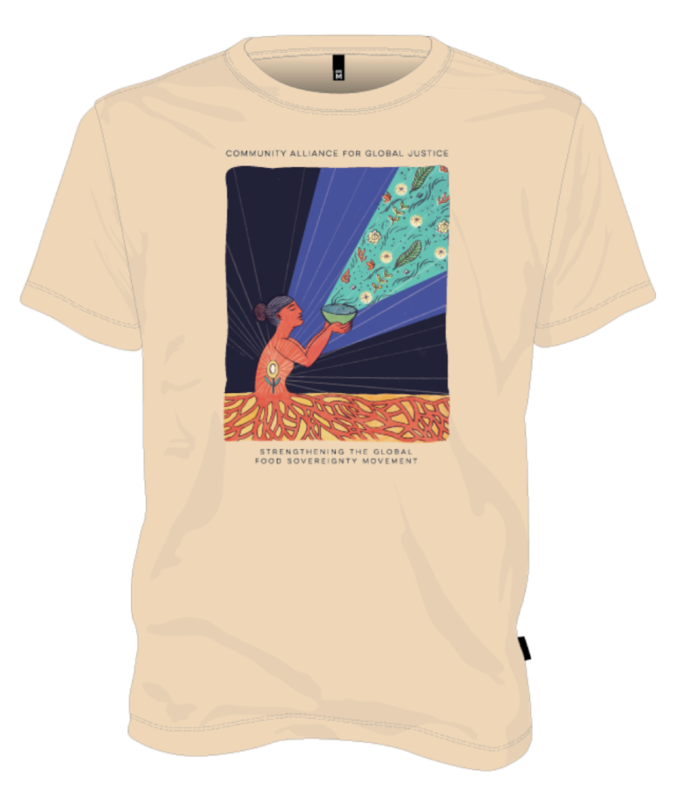 CAGJ’s newest shirt features art and design by Heather Elder, created for the 2017 SLEE Dinner. Printed by TS Designs, super soft, 100% certified organic cotton fiber, made in the USA. T-shirt reads “Community Alliance for Global Justice” above and “Strengthening the Global Food Sovereignty Movement” below. CAGJ Publications: “Our Food, Our Right, Recipes for Food Justice”, 1st edition available as a 72 page zine and 2nd edition available as beautiful 216 page book! CAGJ distributes free copies of our publications to local grassroots organizations, especially those promoting food justice and food sovereignty; contact us if interested. 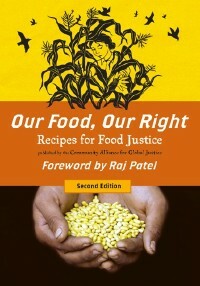 Our Food, Our Right: Recipes for Food Justice (2nd edition) takes you on a journey through many of the current globalized food system’s failures, and showcases creative solutions that communities worldwide are designing to regain control over their food, and the health of their bodies and neighborhoods. 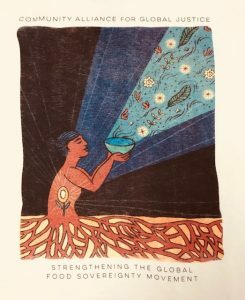 The product of over 50 contributors’ collected efforts and wisdom, this guide has the tools you need to take back your food choices and stand up for all people’s rights to good, healthy and culturally appropriate food! CAGJ published the 1st edition (read more about it below) in 2010. The 2nd edition was published in 2012, with a focus on “Stories of Change” – stories of successful initiatives locally and globally that are helping to create more sustainable food communities. see the Table of Contents. In an effort to make our books as accessible as possible, we are asking $10-$20, on sliding scale, pay what you can. You can also purchase a copy directly from CAGJ (fees won’t be deducted) by mailing us a check or paying in person with cash at our Seattle office – call ahead for times (206-405-4600): 606 Maynard Ave. S. #102, Seattle, WA, 98104 (International District). 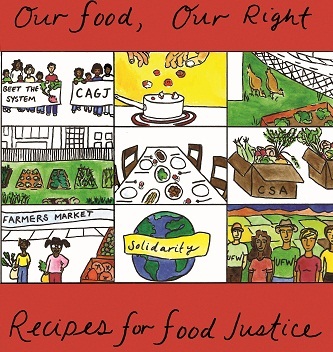 Our Food, Our Right: Recipes for Food Justice (1st Edition) is a CAGJ Food Justice Project publication (72 pages) that combines hands-on tools for change with community recipes and political awareness to engage YOU in joining in the struggle for food justice! Our Food, Our Right promotes community knowledge sharing, self-sufficiency, accessibility, and food justice through a food sovereignty framework. This guide has the tools you need to take back your food choices and stand up for all people’s right to good, healthy, and culturally appropriate food! In an effort to make our book as accessible as possible, we are asking $5-$20, on sliding scale, pay what you can. Original design by CAGJ Member Sage Van Wing (at right), with “Food Justice” highlighted in red, and food translated into 26 languages. The art-work, “Even the Crows Were Curious”, is a papercut by Olympia artist Nikki McClure, who generously donated it to CAGJ for our SLEE Dinners, as well as our poster and t-shirt. Poster is 11×17, printed on heavy-weight paper. Fair Trade T-shirt printed on organic cotton, available in standard and fitted sizes. 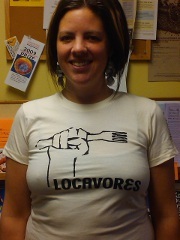 Show your support for eating locally with a “LOCAVORES” t-shirt! The front of the t-shirt shows a fork within a fist, and reads “LOCAVORES” underneath. 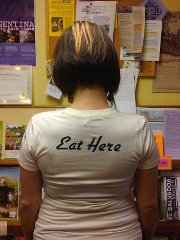 The back reads, “Eat Here” with the same awesome mimic of a food label on the left sleeve. Image shows the “fitted” style. Thanks for your order, your support of CAGJ!